March 1, 2003In one of the classes that I am attending during my study sabbatical in Rome, Italy, we were asked to read an article written by a priest from the Archdiocese of Cleveland, that concerns the spirituality of diocesan priests. One of the topics discussed in the article is the need priests have for an experiences of intimacy. The author states that without healthy experiences of intimacy, the priest will fail miserably in his vocation as a priest. Throughout the article some very valid points are made. But I was disappointed with his discussion concerning intimacy in the life of the priest, in that his understanding of intimacy focused exclusively on horizontal relationships (people to people) while never once mentioning the necessity to develop an intimate relationship between the priest and Jesus Christ.It is not only priests, but also every Christian believer who is in need of deep and satisfying personal relationships with other people, so long as the proper moral boundaries of these relationships are maintained. This is especially true of the need for intimacy between the believer and Jesus Christ. Each believer is invited and encouraged by Christ to come to know, love and serve him as an intimate friend and companion, (John: 15:15). This intimacy between Christ and the believer is built into each sacramental encounter, particularly at the Holy Mass during the reception of Holy Communion. In each of the sacraments there are words, gestures, and touch that communicate to the believer the intimacy that Christ seeks with each recipient. I can, to this day, vividly recall what passed through my mind and heart when Bishop John Paul laid his hands on my head to pray over me when ordaining me to the priesthood. When I felt the touch of the hands on my head I said interiorly, “Lord, it is you.”I believe that most believers have had moments such as my own during the celebration of the sacraments. The sacraments are purposely designed to communicate a personal and intimate presence of our Lord. However, the sacraments are not the only experience where Christ’s personal and intimate presence is made available to us. The devotional life also provides an important opportunity for an intimate experience with Christ. The sacramental and the devotional life should never be viewed as contrary to, or in competition with, one another. It is important that a balance and harmony between the two be established in the life of the believer. However there is a difference between the two of them that affects the experience of intimacy that the believer is able to encounter with our Lord, that being that the sacramental encounter is communal while the devotional is primarily but not exclusively, private.When considering the experience of intimacy in personal relationships, such as with a spouse or good friend, most of us are aware that an intimate encounter seeks situations where privacy, leisure and silence can easily be found and maintained. In this regard, the devotional life by its very nature lends itself to greater possibility for intimacy with Christ. This should not be misconstrued to mean that sacramental/communal experiences are devoid of leisure and silence. Almost every priest will admit that one of the continual challenges of sacramental ministry is to develop and maintain within the Sacred Liturgy a time and space for silence and leisure so that the worshiper can have some time to be with Christ “alone” in their mind and heart. I describe this aspect of sacramental ministry to be a challenge because so often the Sacred Liturgy has to “move along” in order to accommodate another schedule that serves the life of the parish. Also, I believe it more difficult (but not impossible) to experience intimacy with someone when surrounded by a large crowd than in the privacy of one’s home. It is on this particular point, namely, that our homes can become places where deep devotional intimacy is achieved, that I dedicate the remainder of this article. More specifically, I wish to commend to all readers the enthronement of their home and the consecration of their family to the Sacred Heart of Jesus Christ.The enthronement of one’s home to the Sacred Heart of Jesus as well as the consecration of one’s family to that same heart underscores a basic teaching of our Catholic Faith, namely, that the family and home constitute the domestic Church. Jesus Christ desires to enter into our homes and our family life and be an active part of all that goes on there each day. The enthronement, preceded by proper preparation, is an explicit invitation on the part of the family to have Jesus as King and Friend of the family. In the act of consecration, the family seeks for Christ to rule in their hearts and home knowing that Christ’s Kingship is defined by service and love. The love founded in the service that Christ has for each family member is the love that each family member is to have for one another. Christ is asked to enter into the family’s everyday life, to be a true brother and friend. He is asked to provide protection to the home, preserving it from the evil that seeks to destroy the family. The consecration prayer speaks to Christ from the heart about one’s own heart. “Lord Jesus, to Your loving, glorified Heart, Your wounded Heart, we dedicate, we consecrate our weak, our selfish hearts” (Ceremonial for the Family, page 7). Throughout the consecration prayer the words chosen are thoroughly personal and intimate. When a family consecrates themselves and their home to the Sacred Heart it indicates that Jesus Christ is to be an intimate member of that family. That he will be included in the family conversations, that he will be consulted in prayer when there are important decisions to be made and that his image will have a prominent place in the family home indicating his role and place in the family.The image of the Sacred Heart of Jesus provides a special opportunity to foster devotional intimacy. We are well aware that our personal relationship with Jesus Christ is founded on the reality that He is present to us spiritually (also substantially in the Holy Eucharist). It is a unique kind of relationship in that we don’t have a bodily person in front of us the way we do when we have a personal encounter with a spouse or friend. It can be daunting to enter into intimate conversation with Jesus Christ who is “hidden” from us by the glory that He shares with his Heavenly Father. Jesus knows well about this uniqueness. He entered into and continues to share our finite human nature. He knows the challenge that our finitude presents when seeking a personal relationship to the One who is infinite. By choosing to reveal the image of himself as the Sacred Heart to Saint Margaret Mary Alacoque, we are able to observe the love and understanding that Christ has for us. He knows that over time the human person needs to be able to look into the eyes and speak to the heart of the person we desire to love. And so he provided a privileged revelation to be given to Saint Margaret Mary that would help us in this regard. 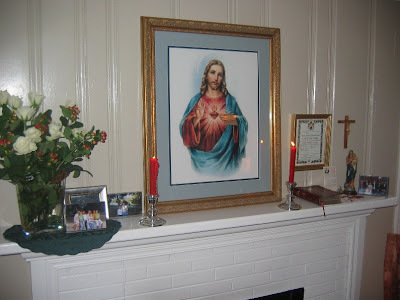 When a family member enters the room where the image of the Sacred Heart has been prominently displayed, it can offer the opportunity for that person to privately, in silence and leisure, speak heart to heart with Jesus Christ. This kind of intimate conversation is essential to the life of the believer.The devotion to the Sacred Heart of Jesus through the enthronement of the home and the consecration of the family provides an important opportunity to enrich and deepen the saving grace that comes to our lives through the sacraments. The devotional life deepens and nourishes our Christian Faith allowing God’s saving grace to have an ever deeper and profound effect in our lives. Marian Catechists of the Diocese of La Crosee should have an appreciation of the devotional life in general, due to the formation program of Father John Hardon, S.J., and also an appreciation for the Sacred Heart Devotion, in particular, due to the initiatives within our Diocese that have been promoted by the leadership and service of our Diocesan Bishop, The Archbishop Raymond L. Burke. 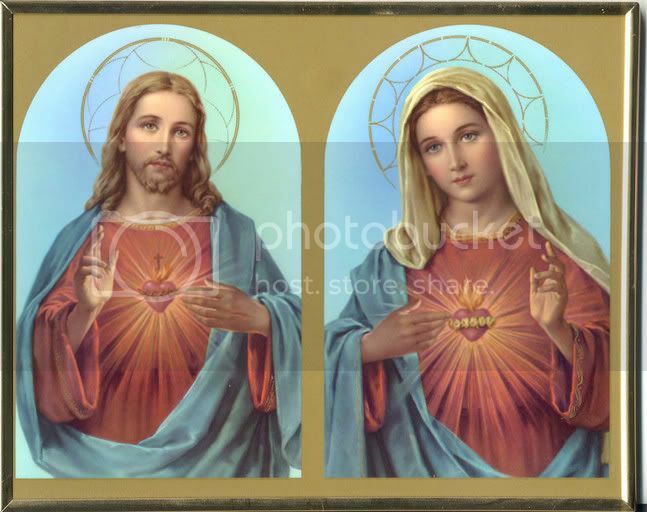 If you have not enthroned your home to the Sacred Heart of Jesus consider doing so and if you have, consider encouraging others to do the same.